Sean Charles O'Keefe (born January 27, 1956) is an American politician. 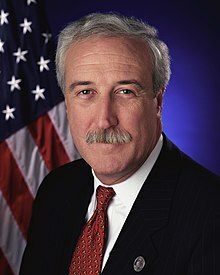 He was the former chairman of Airbus Group, Inc., former Secretary of the Navy, former Administrator of NASA, and former chancellor of Louisiana State University (LSU). He is a former member of the board of directors of DuPont. ↑ "EADS taps government vet", politico.com, October 22, 2009; accessed September 18, 2014. ↑ "EADS North America names Sean O'Keefe as Chief Executive Officer". EADS. October 20, 2009. Retrieved 2009-11-16. This page was last changed on 2 January 2019, at 05:05.